Want some free grocery money? 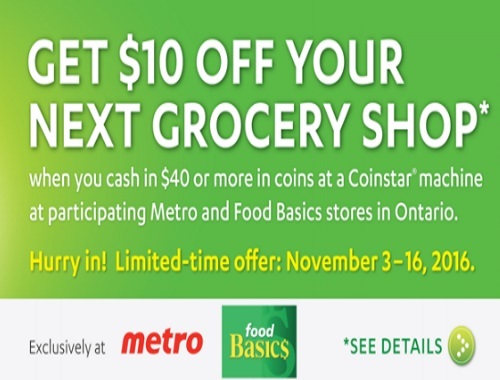 Get $10 off your next grocery shop when you cash in $40 or more in coins at a Coinstar machine at participating Metro and Food Basics stores in Ontario! You will receive a $10 Metro/Food Basics coupon on your Coinstar voucher, coupon expires November 23, 2016. Coupon redemption excludes the purchases of pharmacy prescriptions, cigarettes, tobacco products, gift cards, money orders/transfer, postage stamps, tokens, transit passes, lottery tickets. This offer is valid for a limited time, November 3-16, 2016 only.